Muse opened the show with a big production behind them of attractive ladies paying violins. Considering Mumford are the big thing, it might have been cooler to have them open and have Muse playing a more real band set later in the show. 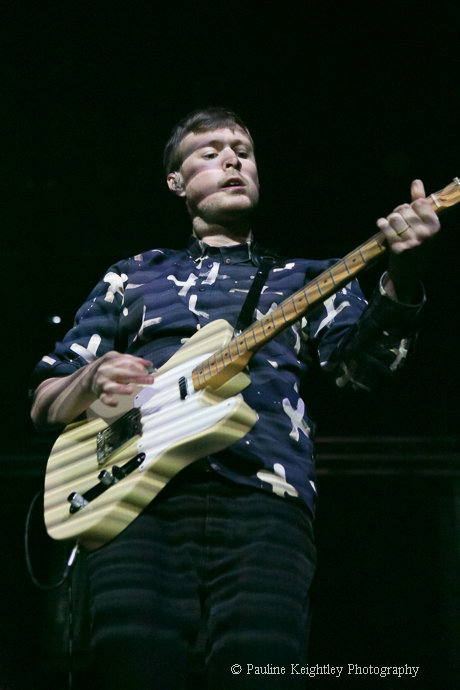 Mumford's dance vibes mixed with folk offer a real fun energetic set. 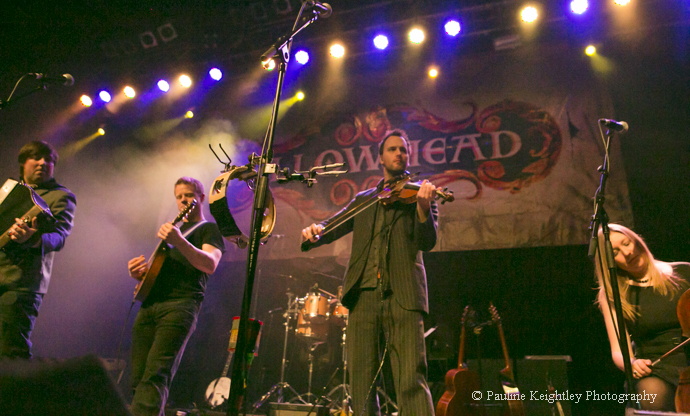 I saw Mumford in Glasgow in April 2010 and they certainly got the crowd dancing and singing. The sets were spot on though and a lot of thought had gone into Robbie Williams chequered backdrop! American artists Justin Timberlake and Taylor Swift performed, as did the pop boy band One Direction who have taken the teenage pop market by storm and have had several number ones worldwide – hugely successful and X factor graduates no less. *The Critics Choice award this year went to Tom Odell – a guy for a change - and another piano playing singer songwriter. He sounded promising when he sang acoustically at the after program, although perhaps sounding a little bit too much like Mumford or Bright Eyes. 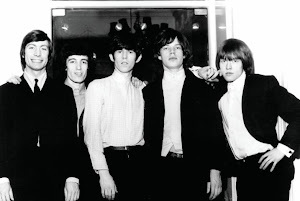 I am not sure at all where the great male singers are these days - except in bands...None of them have anything new to say to me, I have heard it all before. 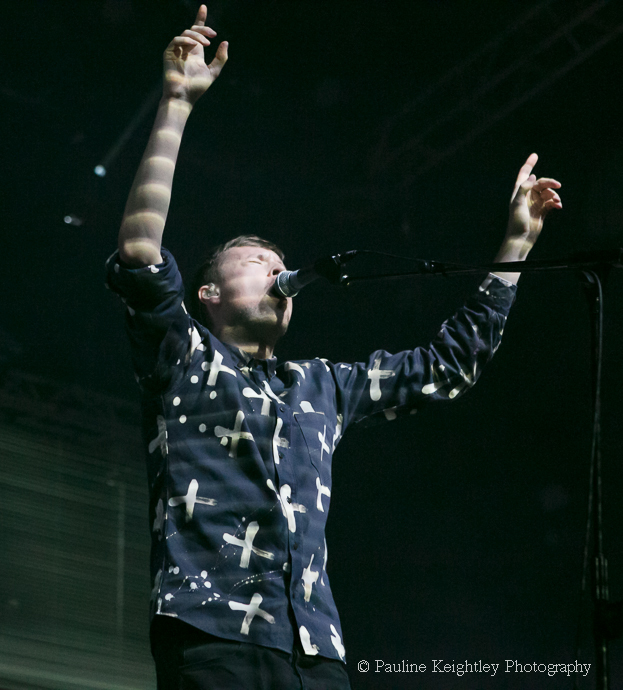 *Ben Howard won – Best Male and Breakthrough. *Lana Del Rey won Best International Female. Frank Ocean (who my son has been raving about) won Best International Male. 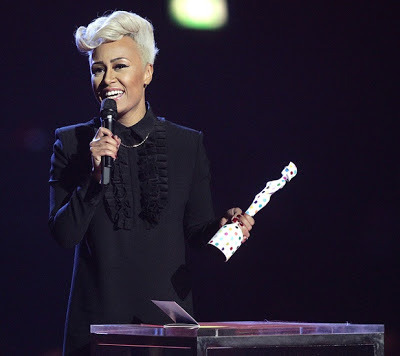 *The highlight of the night was Emeli Sande who won Best Female and the MasterCard Award for Best Album. 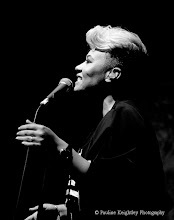 Emeli Sande is the genuine article and she commented after winning the album of the year award, that she was 'an unlikely popstar.' 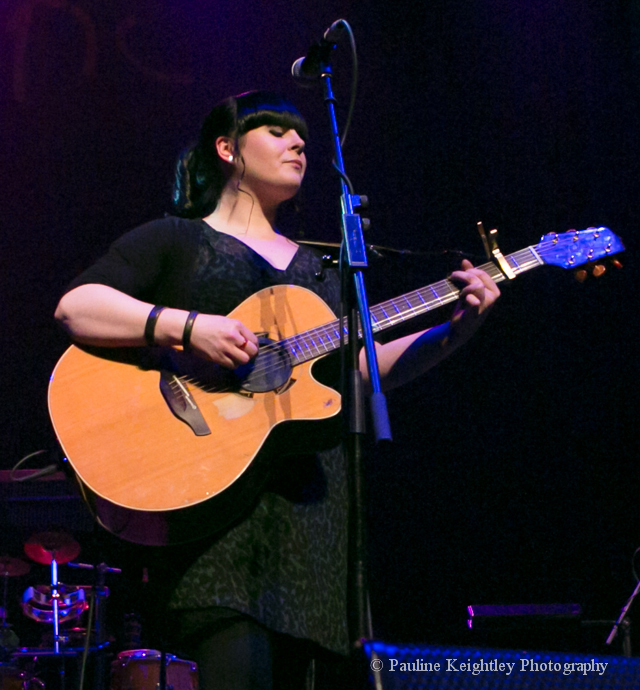 I was very happy for her as I have been following her career since I first heard her sing in 2007 at her cd launch gig here at the Oran Mor Glasgow. The music business makes little sense though I must admit!? Look at the guys - Ed Sheeran, the new James Blunt? or Robbie Williams even who has won the most Brits ever!!?? Oh well at least One Direction are out there! The problem is the mainstream is not really where the best music is. The BRIT awards began in 1977 as part of the commemoration of the Queen’s Silver Jubilee and as an annual event in 1982 under the auspices of the British record industry's trade association, the BPI. The 2011 Brit Awards were held at The O2 Arena in London for the first time in its history, moving from the original venue of Earls Court. 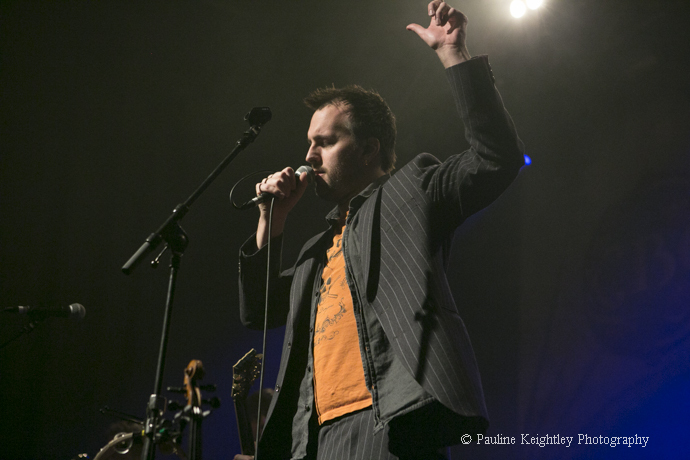 The Concert hall was quieter this year with no Open Mic or Late Sessions, due to renovations at the hall. 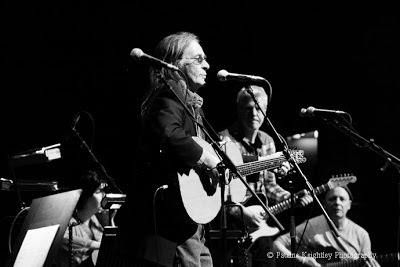 The Roaming Roots Revue of new indie artists. It would have been nice to have made more events, if that was only possible. I also missed the Big Burns Night. I never made the Old Fruitmarket venue which I love at Celtic – for some reason I was more excited by those performing at the ABC venue. 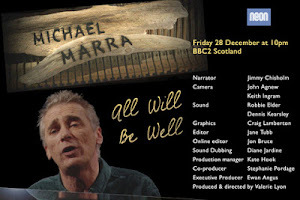 A highlight this year was the concert for Dundee singer songwriter Dundee Michael Marra. 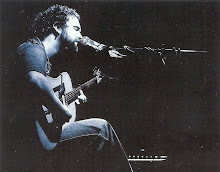 I have seen Marra live several times and he was such an engrossing and interesting artist. We were very saddened by his passing last November. 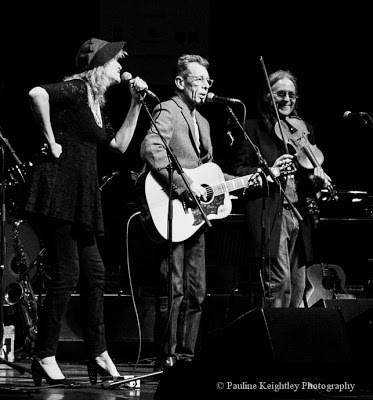 Michael's two children Alice and Mathew Marra were perfoming with their band The Hazey Janes and I got a nice photo with three Scottish legends on stage together at this concert - Dougie MacLean, Eddi Reader and Rab Noakes. This year I saw English folk band Bellowhead and American singer songwriter Aimee Mann at the ABC O2; Cara Dillon and The BBC Scottish Symphony orchestra at the City Halls; and The Transatlantic Sessions at the Concert Hall; and also the Celtic Connections 20th Celebration concert with some of the cream from the Scottish folk scene - Eddi Reader, Julie Fowlis, Phil Cunningham and Rod Paterson. In the past few years I have seen several exciting new artists at Celtic – Manran, Rura, Rachel Sermanni, and this year I caught memorable singer Genesee at the Danny Kyle Open Stage. She was one of the winners in 2013. 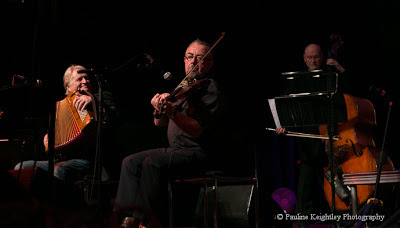 There are several well known musical partnerhips/couples in the folk world – Donald Shaw and Karen Mathieson, Karine Polwart and Mattie Foulds, John McCusker and Heidi Talbot, Cara Dillon and Sam Lakeman, Rosanne Cash and John Leventhal.,,, and more I am sure! 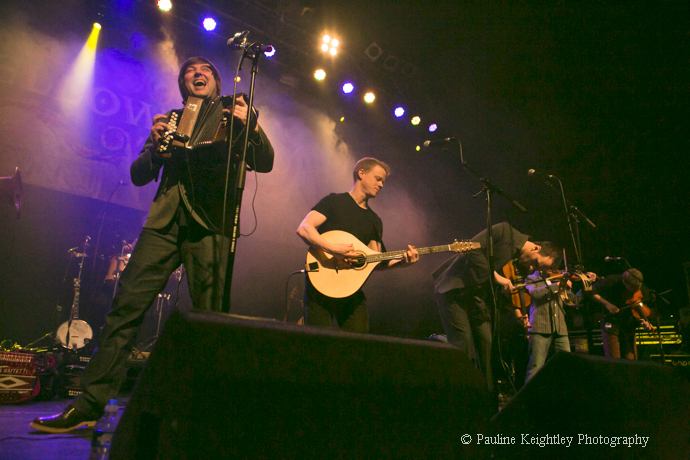 The festival Celtic Connections 2013 ran from Thursday 17th January – Sunday 3rd February and comprised concerts, ceilidhs, talks, workshops, free events and late night sessions taking place over 18 days in various venues across Glasgow - Glasgow Royal Concert Hall, O2 ABC, The Tron, Òran Mór, The Arches, The Mitchell Theatre, City Halls, Kelvingrove, The Barrowland Ballroom, St Andrews in the Square and festival fans’ favourite the Old Fruitmarket all played host to Celtic Connections events. This is my sixth year covering Celtic Connections festival and now I am showing others where things are! I enjoy the buzz. It is also wonderful to have such excellent concerts at this cold time of year. 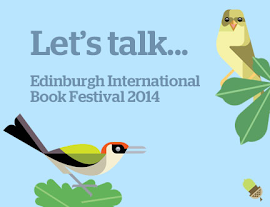 It’s the ideal setting for musicians to get together to collaborate and I look forward to next years festival! Emeli Sande WINS Mastercard Album of the Year at The Brits Tonight! 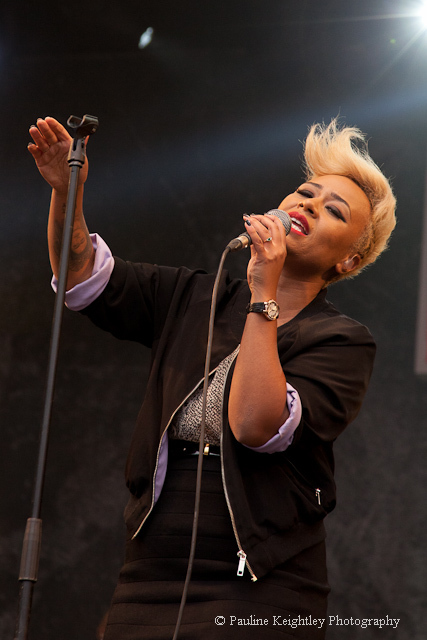 Emeli Sande is nominated for several Brit Awards tonight- Best Female, Best Album, Best Single, Break through Act - http://www.brits.co.uk/ Good Luck Emeli! Her debut album ‘Our Version Of Events’ became the UK’s biggest selling debut album of 2012 and she sang at the Olympic Opening ceremonies in London July 2012. She also found the time to get married in 2012, its been quite a year for her! 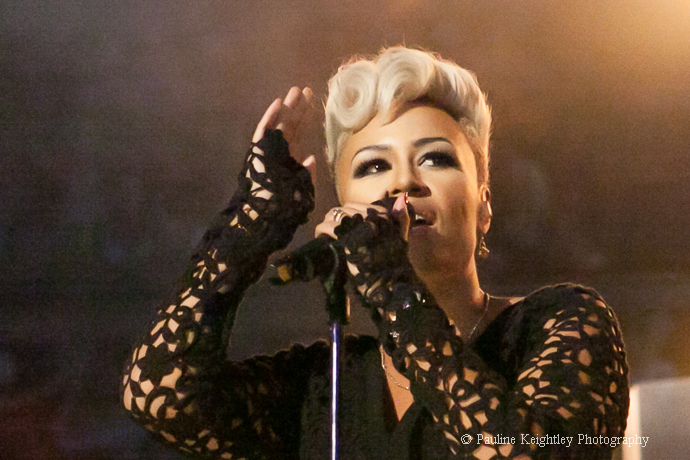 ** Emeli won Best British Female 2013. 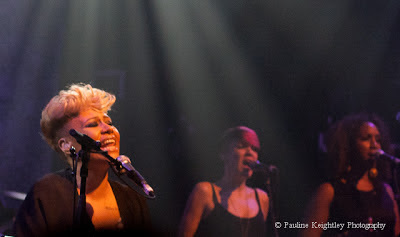 I have been following Emeli since her Oran Mor gig here in Glasgow December 2007. I got come nice shots there that were used for her promotions in the following years. I first took shots of Emeli at the Oran Mor 2007 and she was attracting attention then for her big soul voice. Since then she has had several chart hit singles. I met her at her sound check King Tuts back in 2010, and was pleased she gave me time to discuss her music. 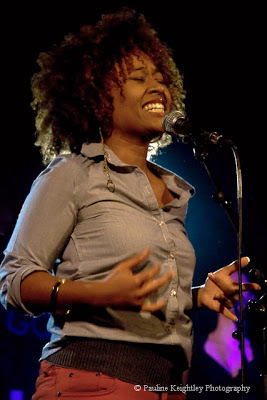 She said then she hoped to do edgy or rockier soul pop and was influenced by American soul artists such as Nina Simone. 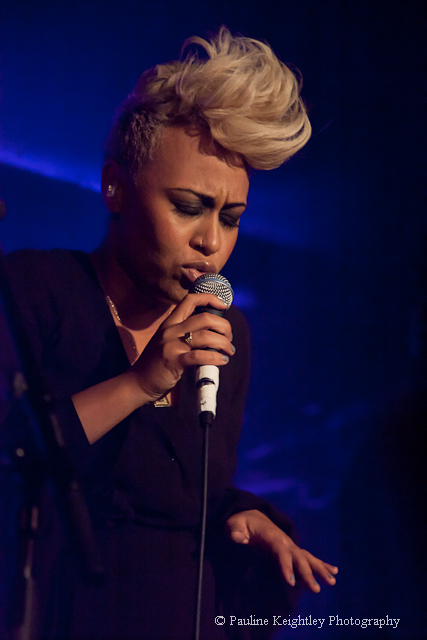 Emeli described her sound as 'soul with a rockier edge.' She told me her musical influences came from a diverse range of artists such as rock bands Massive Attack and Portishead, as well as from folk singer songwriters such as Joni Mitchell. I thought then that Emeli had substance and heart and a big future ahead of her. I enjoyed the positive messages of her songs which compare well to some of the rather raunchy or even questionable lyrics of many pop songs out there. 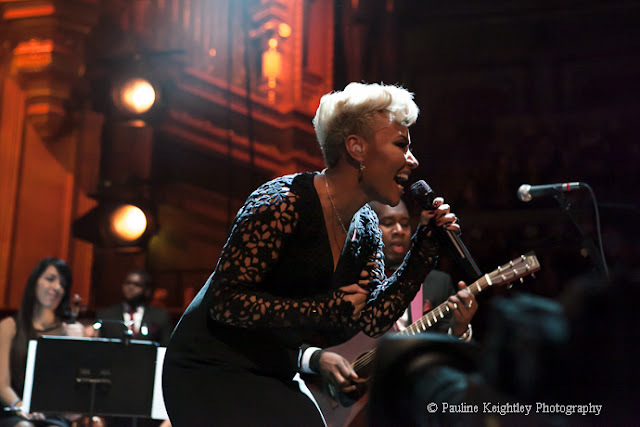 Sande sings of Wonder, Next to Me and My Kind of Love. 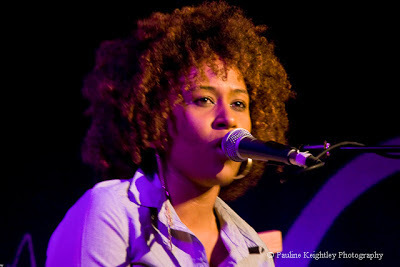 Sande plays piano and clarinet, and sang in the school choir (where her Zambian father was a music teacher). She was born in Sunderland and moved to Alford Aberdeenshire when she was four. She was previously a student at Glasgow Medical school. After attaining her inter-collated degree, she decided to pursue her dream in music and signed a publishing deal in 2009. Since then she has written with artists in London and America over the past few years, and has co-written songs with well known American soul singer Alicia Keys. 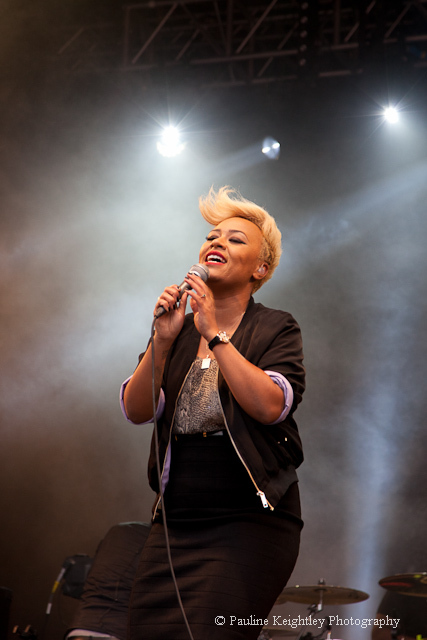 I first saw Emeli perform at her CD launch Oran Mor in 2007 and back then her influences were mainly soul, and singer songwriters such a singer Nina Simone. Her new songs for her debut album our Version of Events had more character and rhythm, structure and vibe around them and a broader range of influences. In many ways it seems unbelievable to me her successes this past year and her singing Abide With Me at the Olympic ceremonies in London July 2012. 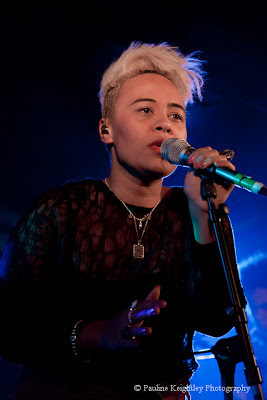 Emeli said she missed the intense studying in the university library then at King Tuts, but I expect now that she is glad and proud of her decision to move to London in 2009 and pursue her music career! Thank you Emeli for signing some of my prints. Emeli Sande says – we don’t express ourselves in music but rather that the music expresses us. 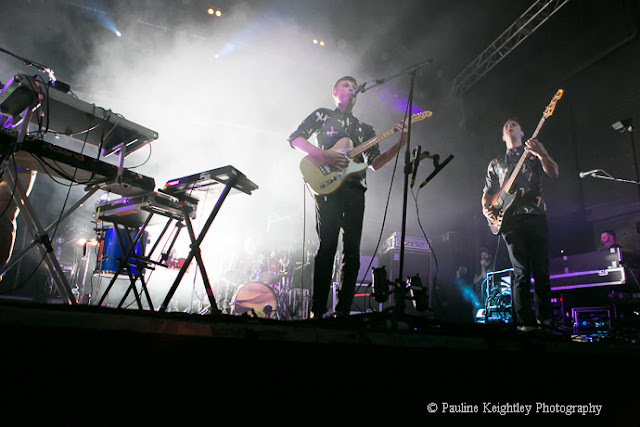 The tour was headlined by Mercury nominated Django Django, who met at Edinburgh Art college and whose debut album has received good reviews. The band had an energetic electronic keyboard player who played creatively and the band offer a new sound. Palma Violets had charisma and are being hyped extensively in NME. 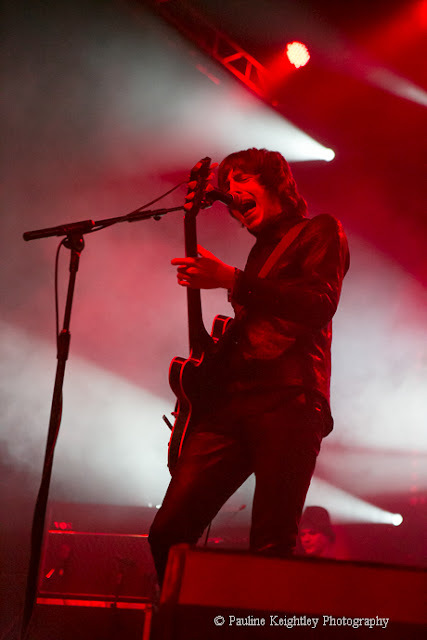 Miles Kane proved a stage veteran and clad in buttoned up leather he had good banter with the crowd were well up for his set! Kanes songs have catchy bass rhythms. The Transatlantic Sessions concert is about the collective spirit of music with some of the cream of Scottish and American Celtic music. 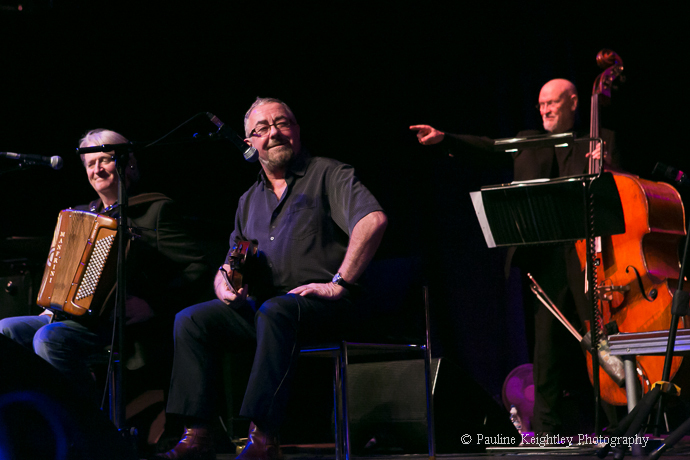 Both musical directors Jerry Douglas and Aly Bain are outstanding musicians. The musicians were joined on stage this year by the singers - Teddy Thompson, Emily Smith, Eric Bibb, Aoife O'Donovan and Mary Chapin Carpenter. 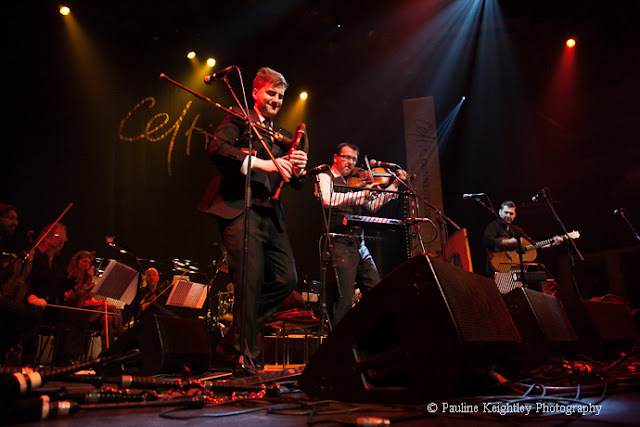 The Transatlantic Sessions now tours the UK after its Celtic concerts and they also played over in the US last year as part of Celtic Connections' showcase for the Ryder Cup Chicago, ahead of the contest's coming to Scotland in 2014. 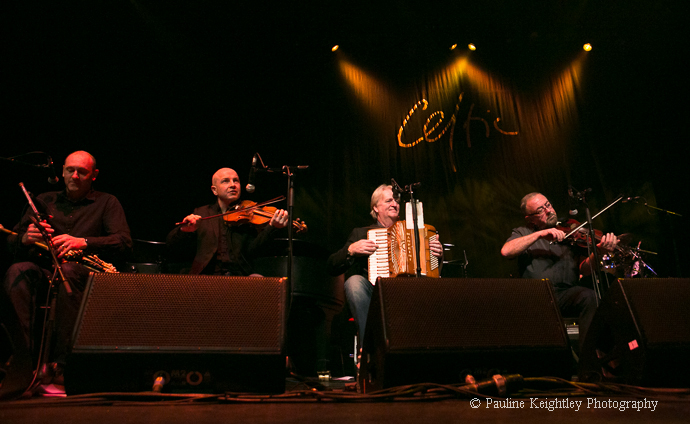 It is also the main event at Celtic Connections festival Glasgow each year. The Transatlantic concert began with the tune Waiting for the Federals played by all the players in the Transatlantic band. 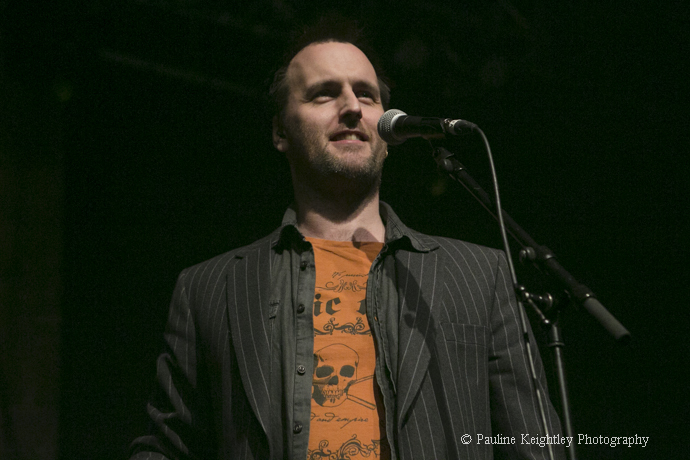 Douglas introduced singer Teddy Thompson (son of Richard Thompson) who sang Delilah and Dear Mary. 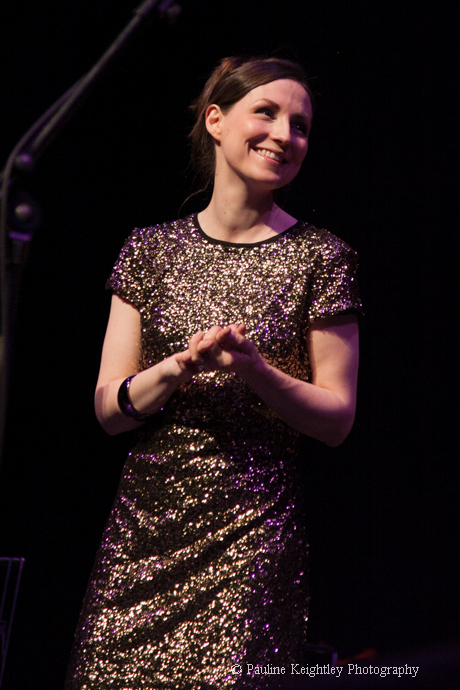 Next Emily Smith sang a Robert Burns song Silver Tassie and her own song A Day Like Today. 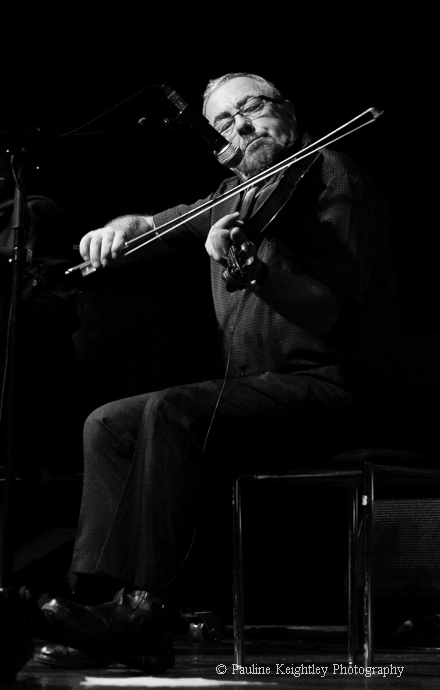 Bluegrass banjo player Dirk Powell sang the Cajun two-step French song Step de Bonne café. 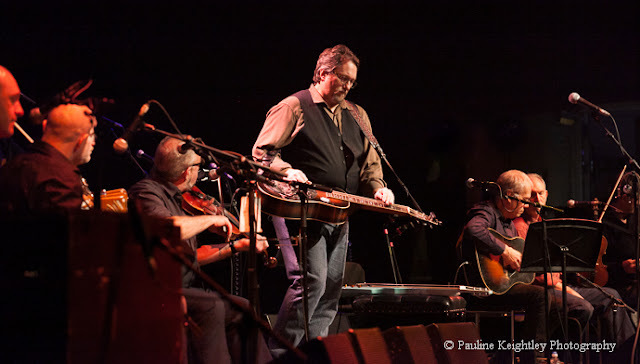 Dubro player and the most recorded artist ever, Jerry Douglas played Gone to Fortingal. 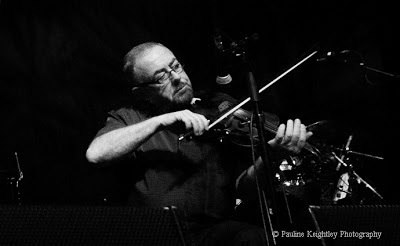 He really is a very striking musician; he also plays with Alison Krauss and Union Street Station. Jerry made the comment that Scotland had romantic tunes but that the US had the titles! Next blues singer Eric Bibb sang New Home and Goin Down This Road Feelin Bad. Aoife O’Donovan of the band Crooked Still, sang Hallowell backed simply by piano, and along with Mary Chapin Carpenter and Elaine Smith created some beautiful female harmonies when they sang the song Bright Sunny South. The band played the tune The Helvic Head and then Grammy award winning Mary Chapin Carpenter sang Chasing What’s Already Gone and I Have a Need. 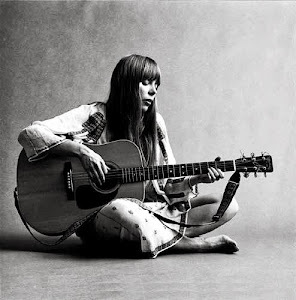 She used moving expression and interpretation with her songs of heartbreak and longings. 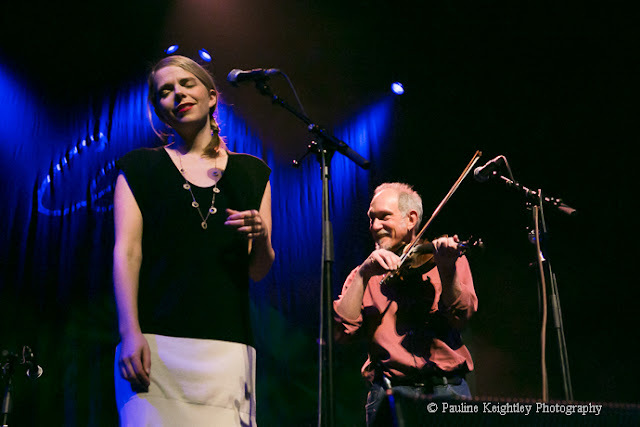 Second Set: Bruce Molsky and Aoife O’Donovan preformed Pretty Saro. Teddy Thompson sang What Was I Thinking. Mary Chapman Carpenter sang Transcendental Reunion. 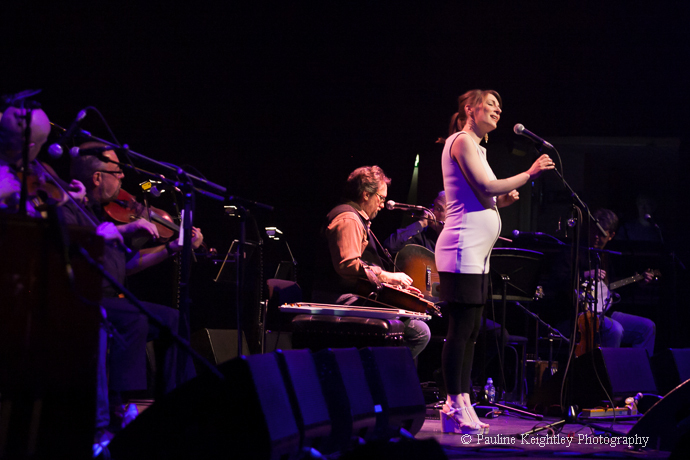 Aoife O’Donovan sang O Mamma backed by fiddler John McCusker, after which Eric Bibb sang Champagne Habits. Accomplished guitarist Russ Barenberg played the tune Through the Gates. Dirk Powell played Waterbound and Scottish accordion player Phil Cunningham played one his own popular compositions. Emily Smith sang The final Trawl and Phil Cunningham, Aly Bain and Michael McGoldrick played Phil’s Air - a tune written about Sir Walter Scott. 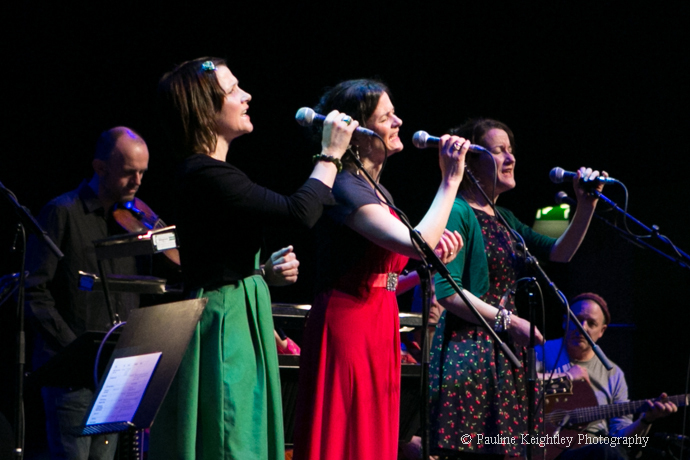 The finale was an uplifting Down at the Twist and Shout with all the singers and band on stage. 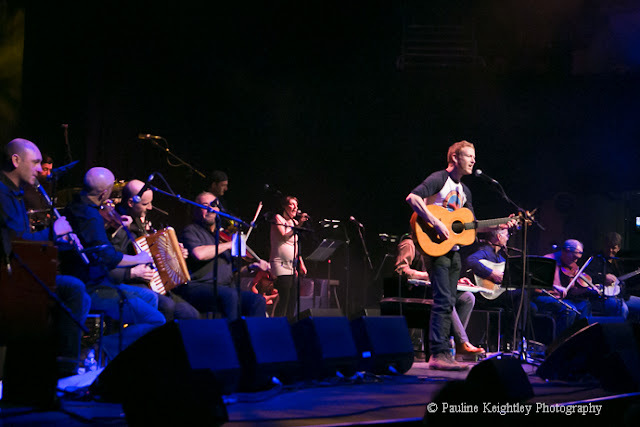 There is nothing much that can beat having such a top quality gathering of musicians and Teddy Thompson, Emily Smith and Aoife O'Donovan are all very gifted singers. I enjoy watching Aly Bain play, he has a relaxed, easy style that makes it look effortless and he’s a master of his craft. 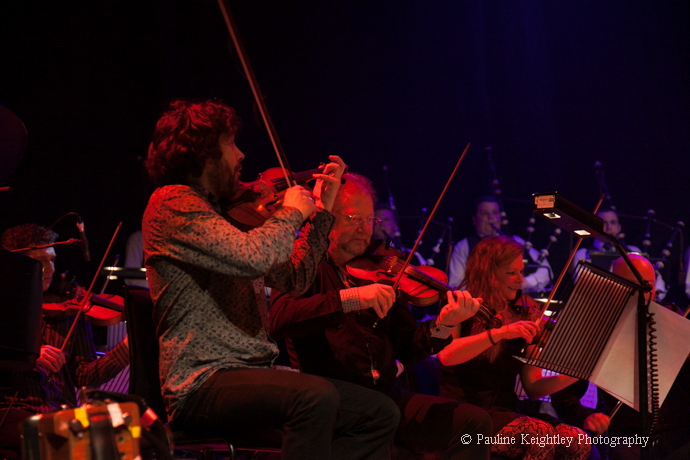 As someone remarked this concert is extremely good value considering the number of quality artists that perform! I did miss Jerry Douglas’s solo performance at the start of the second set which allows us to hear his skill and musicianship to great effect and provides a contrast with only one player on stage. We also missed both American Tim O’Brien and well loved Scottish singer Eddi Reader this year. Thanks to Festival music director Donald Shaw for all his hard work to make the festival such a successful event. And a thanks to the Celtic press team for a nice list of the artists set list and songs, this helps greatly with writing up these reviews! Cheers. I'm enjoying my read of Neil Young's Waging Heavy Peace' - what a character! And 'hippydom' in California... Those were such free, idealistic times.. I had a lovely evening of music on Friday. 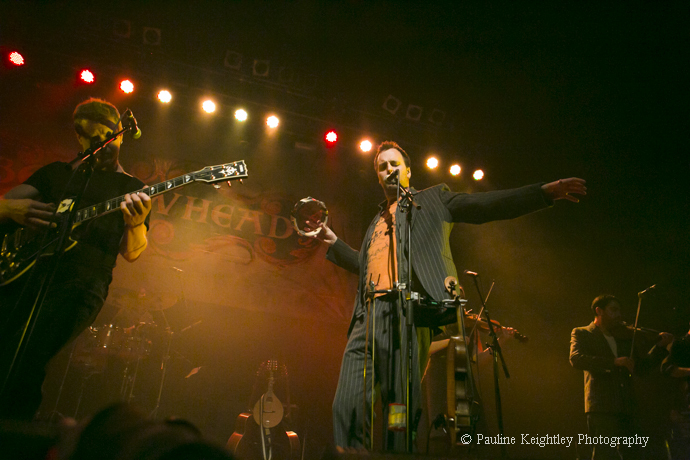 I saw English folk band Bellowhead who were exhilarating and I got some fun shots. Processing after the show I was treated to my favourite music on BBC 4 (I had sent in a request!?) - George Harrison's concert for Bangladesh, and after Mozart concerto for clarinet. Thanks Channel 4. 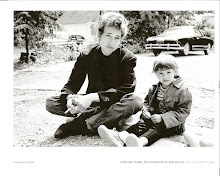 Harrison, Clapton, Dylan, Mozart - some of my best loved artists and tunes. Perfect. 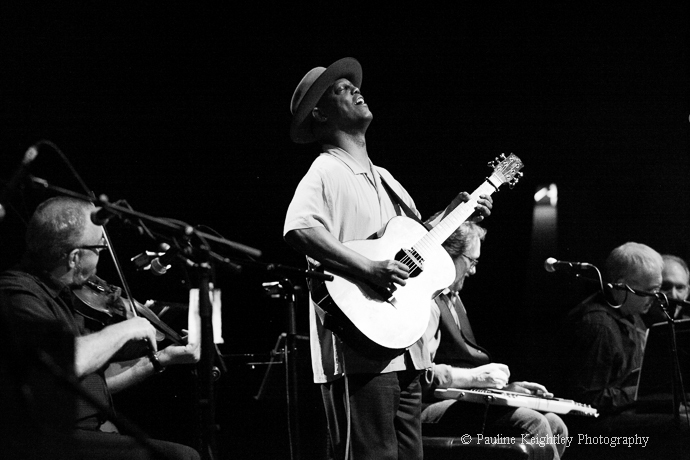 Do we speak to each other through music - to other cultures and others ways of life - more vividly? 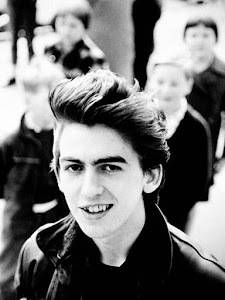 Examples - George Harrison's Concert for Bangladesh. 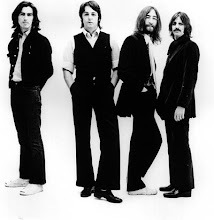 Paul Simon's Graceland; Lennon's imagine..
Those were such dynamic and new times for music. Renewal. I highly recommend composer Howard Goodall's 'History of Music' BBC - last week Haydn (the dapper gentleman), Mozart (freelance star turn), Beethoven (tormented diva), Chopin - interesting learning about these composers I've played and loved for so many years. These composers used the pleasure principle for elegance and beauty. Last weeks program on composers Bach and Handel was wonderful too - spiritual and compassionate. The symphony, Circle of Fifths and Equal temprement. Bellowhead were great fun and exhilarating and great for photos. 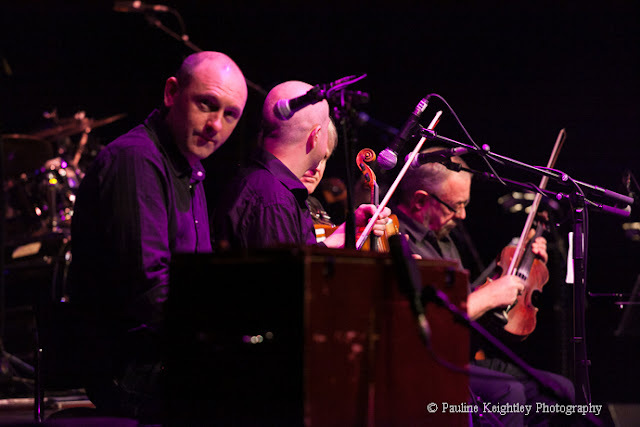 They are a ten-piece English contemporary folk band who did a show at the ABC 02 Glasgow during Celtic Connections 2013. 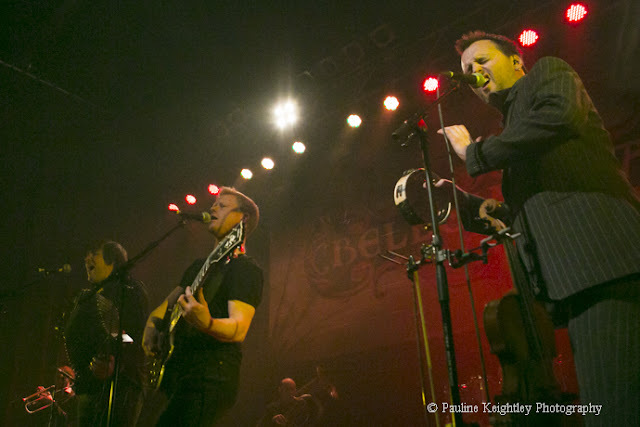 The band includes a four-piece brass section and play many instruments between them. I met another photographer there who was shooting for the EFDS, the English Folk Dance and Song, an organization which was set up to promote English folk music. 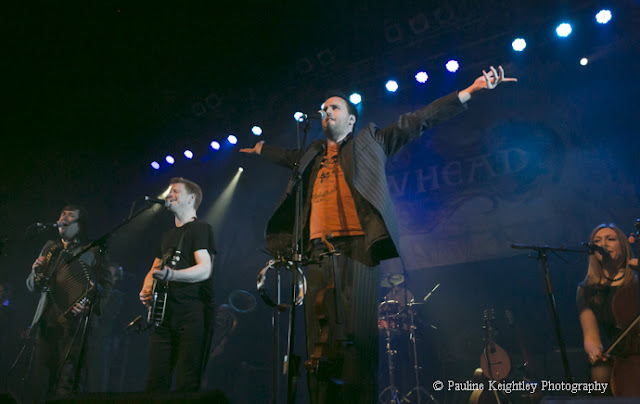 He said that Bellowhead started with the duo of Jon Boden and John Spiers. Speirs plays melodeon and concertina and Boden plays fiddle and guitar while he also stamps the rhythm on a stomp box. They brought in the other musicians to form a full band to help fill the gap in the market for a top quality English folk band. 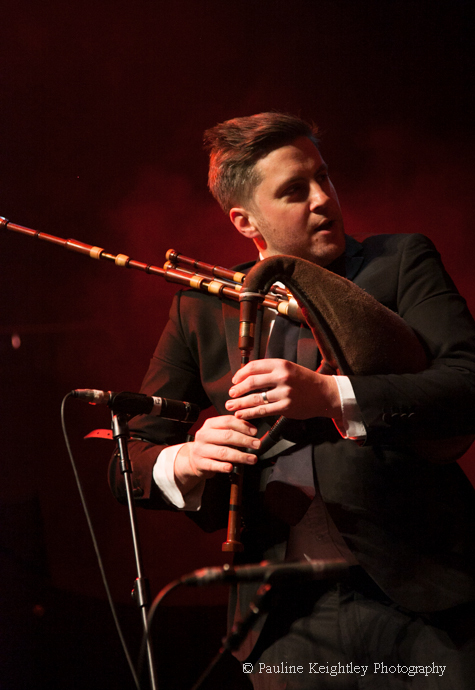 Their line up includes - Benji Kirkpatrick, Rachael McShane, Paul Sartin, Pete Flood, Brendan Kelly, Justin Thurgur, Andy Mellon and Giles Lewin. They sang vocal harmonies on traditional folk songs as well as playing many jigs and reels of traditional country dance tunes and sea shanties. 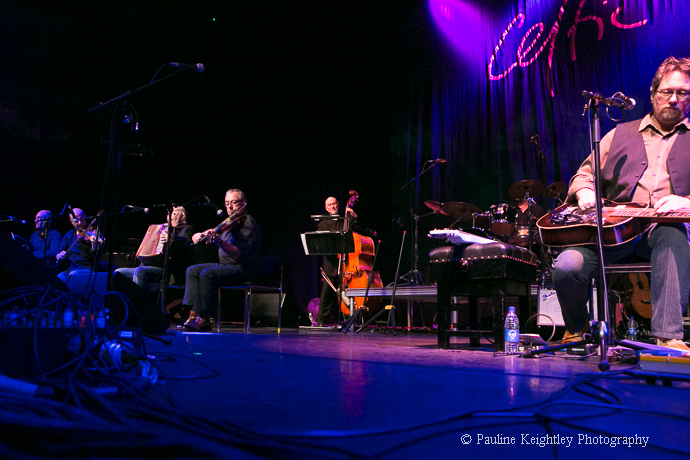 Their sound draws on a diversity of musical styles and influences – from the old English tunes Greensleeves and ‘Can You Dance the Polka’ and to a sound similar to the popular in the 70s English folk band, Steeleye Span. Jon Boden proved a naturally theatrical front man as he waved his arms wide and brought the audience with him. 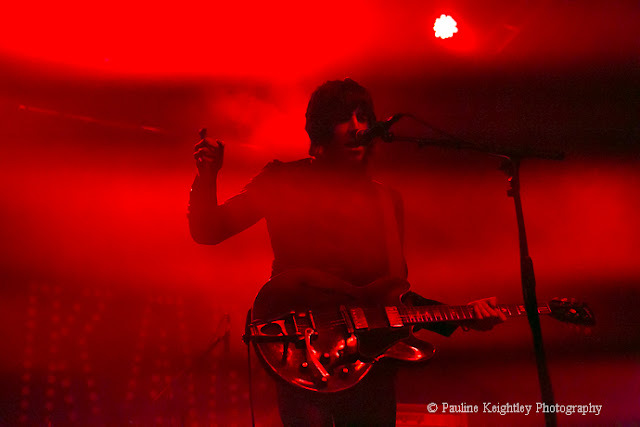 They were polished and energetic on stage and the band have won awards as the Best Live Act. The packed crowd of all ages were clearly up for a good night! 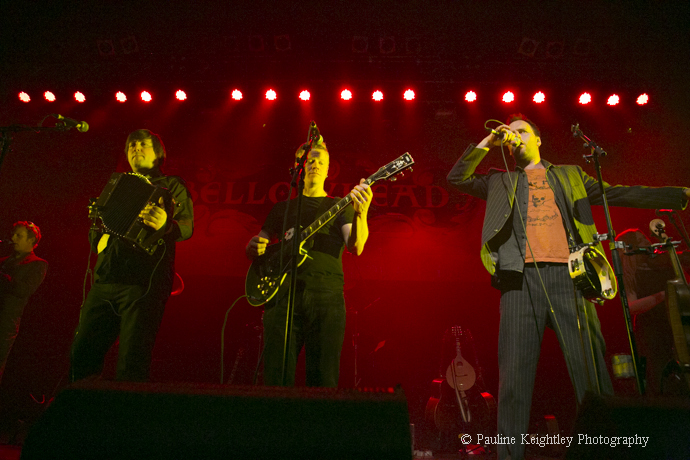 I highly recommend the band for a fun night out and it was good to see a band making folk accessible for a younger audience. 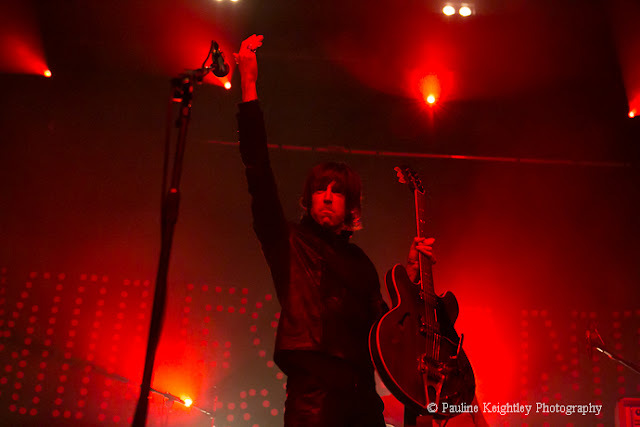 I did wonder why they weren’t playing at the more atmospheric and old world charm of the Old Fruitmarket venue Glasgow, which would have fitted their sound perfectly. Bellowhead have gathered several awards and recently the BBC Radio folk award for their 2012 album, Broadside, which made No.16 UK official album charts and number 1 in the UK independent album charts. 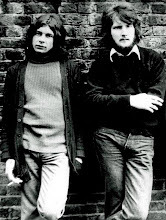 Their previous album Hedonism went silver (selling over 60,000 copies) and is the highest selling independently released folk album ever. The band developed a new ale to go along with their album release!